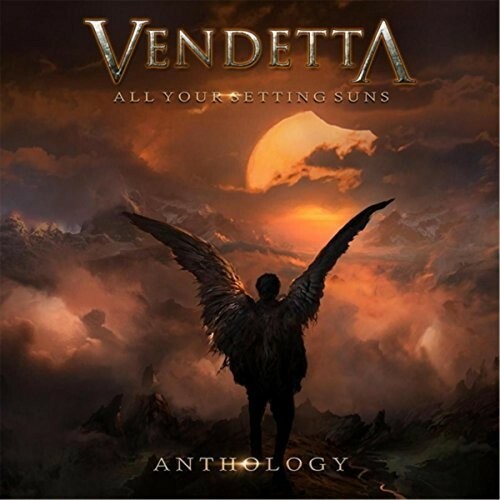 Hailing from Newcastle Upon Tyne in the industrial north east of England, Vendetta was formed in late 2005. Guitarist Edward Box had already released two solo albums ('Plectrumhead' and 'Moonfudge') with Lion Music but had grown tired of the being alone and wanted to try out some vocal-inspired material he had written. Calling on his old friends, guitarist Pete Thompson and bass player Gary Foalle, the initial plan by Box was all about trying the song format and see how it could sound in a fully amped environment. So a discography of three albums followed just afterwards, with 'Tyranny Of Minority' (2007) being the debut and most acclaimed one and 'Heretic Nation' (2009) and 'World Under Fire' (2012) coming out later. The one you are now reading about, instead, is a double compilation featuring two discs; the former, featuring their most convincing efforts (some of them even re-mixed) with the latter showing us the live side of their tracks. Vendetta plays some very traditional and conservative British Metal but, surprisingly, more akin to Primal Fear and Sinner than Judas Priest, though their lyrics have surely got a more social/political edge which definitely makes them free of predictable stereotypes. Now, the point is that, differently from their German Metal brothers, this so well played and carefully arranged music lacks of a proper presentation. And, when I write presentation, I mean production or the sound display. Frankly, during the years, I've stumbled into Lion Music issues quite often and I've always found the same unbearable problem. This time this negative aspect is even more annoying, if I think that 'New Horizon' is such a great song with its razor-like riffs, its passionate dual solo and its crystalline vocal hooks. It is then totally put down and quelled by a disarming sonic flatness where the guitars remind me of the garage days of Tygers Of Pan Tang and the rhythm section is completely annihilated. The additional insult is that I'm talking about one of the "re-mixed" ones. It's the same scenario with 'Lost Cause' and 'Delusion', which could have delivered with the right treatment and surely attracted many more Metal defenders. Sometimes a good compilation can represent a chance to renew and refresh the most valuable and strongest repertoire of a band and possibly adjust some mistakes but here, little or nothing has been made, not even with the live versions.